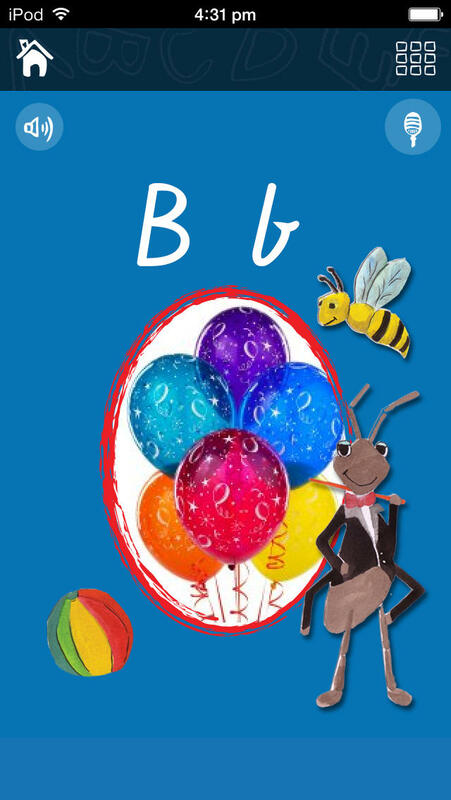 My Very Own Alphabet App aims to teach young children the English alphabet. This app aims to teach young children (preschool and early primary school) the English alphabet. It is designed for the iOS system only. Interaction with the first five letters of the alphabet (a, b, c, d, e) is free. This app aims to teach young children (preschool and early primary school) the English alphabet. It is designed for the iOS system only. Interaction with the first five letters of the alphabet (a, b, c, d, e) is free. The full version of the app can be purchased from iTunes via an in-app purchase. It does not contain any in-app advertisements and it does not request for personal data or signing in. The app allows the creation of albums with letters for different users. Parents can create one or several albums with letters for each of their children. The front page of each album is editable. Users are allowed to add the image of their child by importing this from their iPad/iPhone or take a new picture, name the album and add a date (e.g. creation date). Then, each letter has its own page in the album. For example, the page for the letter A presents the letter in lowercase and capital letters using, as the designer states, the fonts taught in most Australian schools. When creating the album, users can add an image that relates to this letter, for example, the image of an airplane. 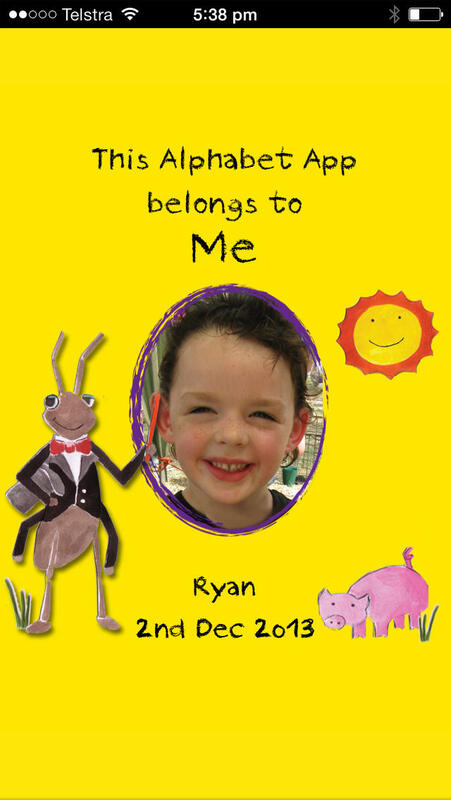 The main hero of the app is Angus the ant. It appears on all album pages. By pressing the face of the ant, you hear the name of the letter and by pressing its belly, you hear the sound of it. Also, you can record your own words and sounds that relate to a specific letter and access these every time you enter the album. Navigation across album pages is easy and straightforward (you swap the screen). All alphabet letters can be viewed and accessed through a grid. The album can either be in edit mode (changes can be made to the album) or read mode (no changes are allowed). The app comes with very comprehensive guidelines illustrating the functions of the app. This app looks professional, is very well-designed and friendly. The images used in the app are appropriate for young children. The major strength of the app is its flexibility. It can be used and reused allowing children experimentation with different images and their relationship to specific letters of the alphabet. It also allows children to show their work and compare it to other children. It could be easily used in the classroom as an interactive alternative to paper alphabet books. It should be noted that the designer is not a professional app company, as it would be expected, but a mother with an interest in helping children to learn. In the future, it would be nice if the designer enhanced further the apps' flexibility and potential for personalized learning. For example, the fonts are generally very comprehensive and commonly used. Yet, it would be nice to give the option to users for personalization by allowing selection from a range of font styles or even allowing the creation and uploading of the users' own letters to the app. The latter could allow children to practice and show their writing skills and capture their progress as they become more efficient in writing. Fonts in different languages would also be useful and allow for use by a broader audience. In terms of the app's interactivity, it would be nice to press and hear the name of the items (images) placed under each letter, e.g. letter A: there is the image of an apple. Similarly, it was not intuitive that Angus could say the name/sound of the letter - the little circles that indicate a press button should be more prominent to draw the user's attention. Finally, it would be good to include at least one activity for assessing children's understanding of the alphabet, such as a matching activity (letter - image). 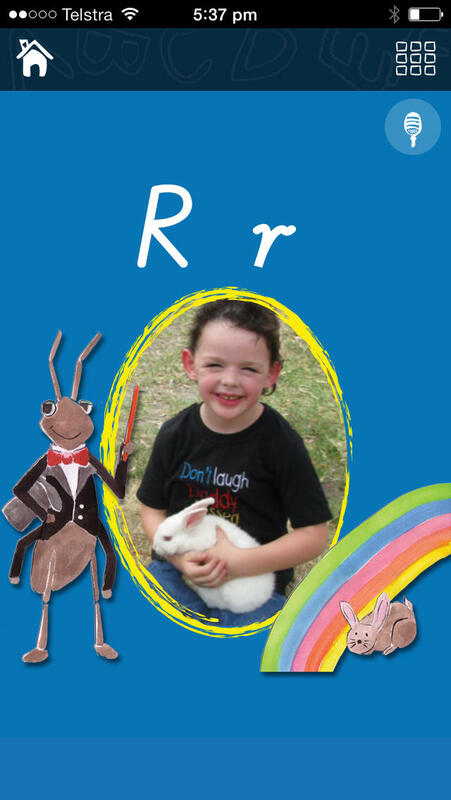 Angus will take your child on a personalised journey to learn the Alphabet. The Font used is Vic Modern Cursive. This font is taught in most Australian schools. Early visualisation of familiar text will enhance your child's learning ready for kindergarten and school. 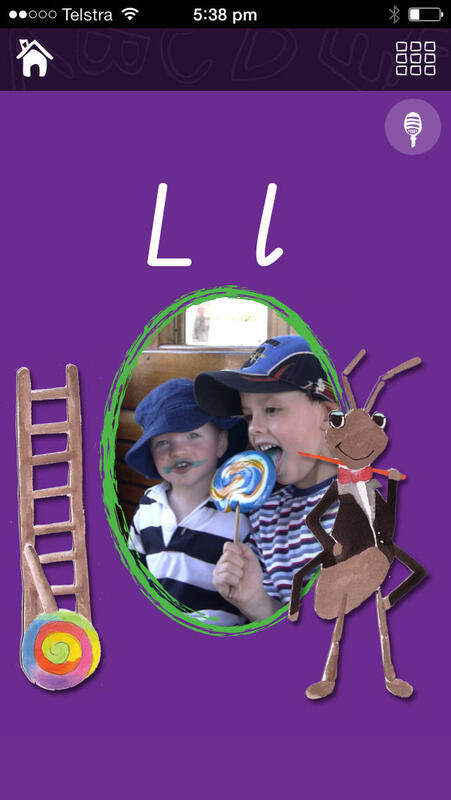 My Very Own Alphabet App can also be very useful for older children or even Adults with disabilities who need assistance learning the alphabet. Angus' voice could also assist people needing to learn the pronunciation of our natural Australian accent. Tap on the oval and insert familiar pictures from the image gallery, your camera roll or take a photo. First 5 letters free, then in-app purchase 1.49 cents to unlock the rest of the alphabet. Home screen; Insert a picture of your child and their name. Tap on Angus' head to hear the name of the letter and on his tummy to hear the sound of the letter in an Australian accent. Tap on the speaker to record audio. The recording feature allows you to record audio with the name of the picture, in your own language / accent, with your own pronunciation. Personalising your child's learning. The App has two modes - Read Only and Edit. -Read Only Mode - User can view album images and voice recordings done earlier. But, the user cannot edit/delete images or voice recordings. Great option so little people don’t delete all Mum and Dad’s good work setting it up. -Edit mode – The user can add or delete images or voice recordings. Swipe horizontally to view the next or previous letter of the alphabet. The grid screen shows which screens have been completed or tap to allow easy access to individual letters. Completion screen is to record the date of that memorable occasion when you child knows all of their alphabet. Tap on done to hear a well done from Angus. App will be supported on both Retina and Non-Retina display devices. Supporting all versions of iOS4.3 and above (including - iOS 5 and iOS 6.0). Basic app functionality will work on 7.0. Our illustrations mainly begin with short sounds. In early learning, it helps initially to use either the short sounds only (a for apple) or the long sounds only (a for ape), to avoid confusion. With repetition and progression, the child will eventually associate the pictures with the letters and will understand that most letters have more than one sound. As your child progresses, teach them to say the name of the letter and then the sounds illustrated. Then the actual names of each letter of the alphabet will be learned. Learning in these early stages should be fun. Encourage your child, do not force them. If you can get their attention for more than a couple of minutes look at it as a bonus. I welcome feedback of any kind. This is my first and probably only App that I will ever make, so any ideas to improve it would be greatly appreciated. After all I am really 'just' a Mum ! My Very Own Alphabet series has been created and designed in Victoria, Australia by Wendy Coyle – Rainbows & Rain.